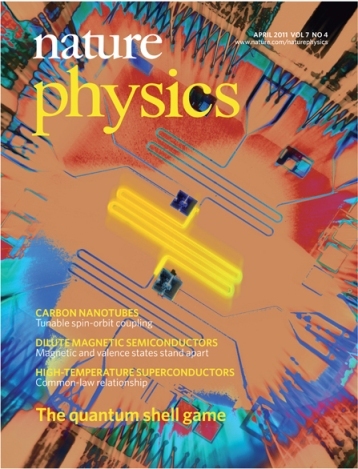 Featured on the cover of the February 2017 issue of Nature Physics: Our article on superconducting circuits, coupled to form a ring in which a photonic excitation can circulate between sites, being established as a versatile platform for studying the interplay of strong particle interactions and external fields. Featured on the cover of the November 2016 issue of Nature Physics: Our article on the realization of a quantum kicked top provides evidence for ergodic dynamics and thermalization in a small quantum system consisting of three superconducting qubits. 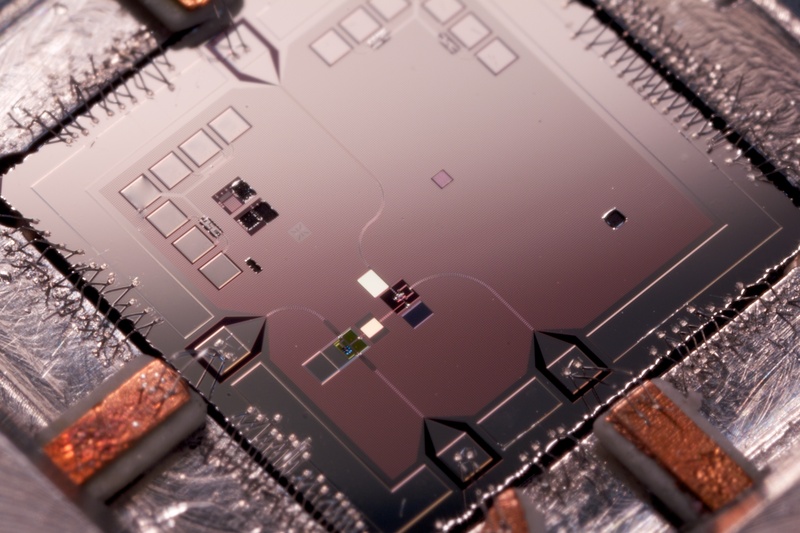 Photograph of superconducting circuit with nine qubits where, for the first time, the qubits are able to detect and effectively protect each other from bit errors (Photo credit: Julian Kelly). This Nature article has been featured in the New York Times, Wired, IEEE Spectrum, Nanotechweb, the Google Research Blog, and a UCSB press release. 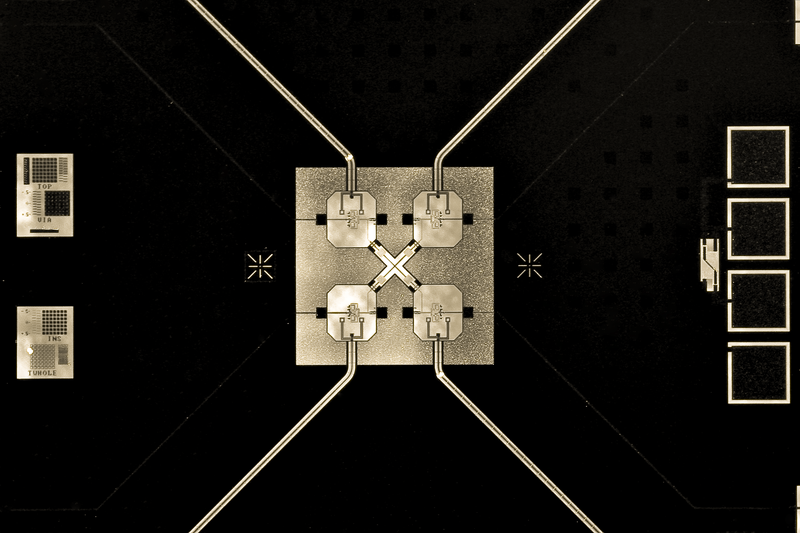 The superconducting quantum circuit with five Xmon qubits (cross-shaped devices) placed in a linear array. 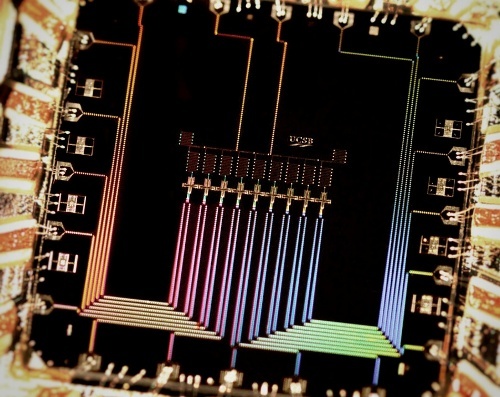 The quantum device shows logic gates with fidelities at the surface code threshold for fault tolerance. (Photo credit: Erik Lucero.) 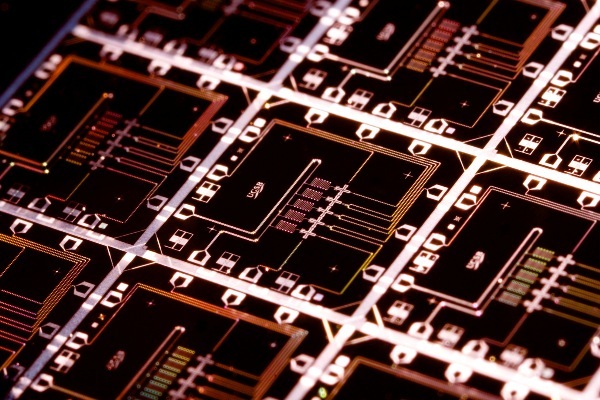 This Nature article has been featured in a press release, Christian Science Monitor, IEEE Spectrum, International Business Times, Condensed Matter Journal Club, Photonics Spectra, EE Journal, Science News, and Techfragments. Congratulations to Zijun "Jimmy" Chen and Chris Quintana on being awarded NSF Graduate Research Fellowships for 2014. 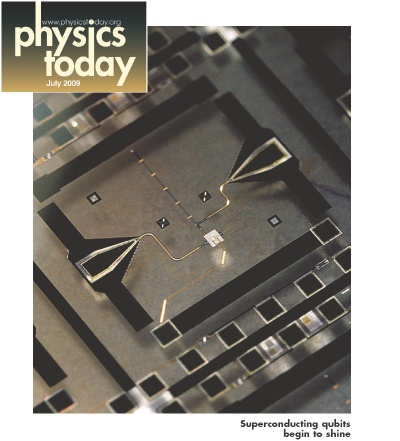 This illustration by Dario Mariantoni and our own Erik Lucero and Matteo Mariantoni graced the April 2011 cover of Nature Physics along with an article on shuffling photons between resonators in the ReZQu architecture. 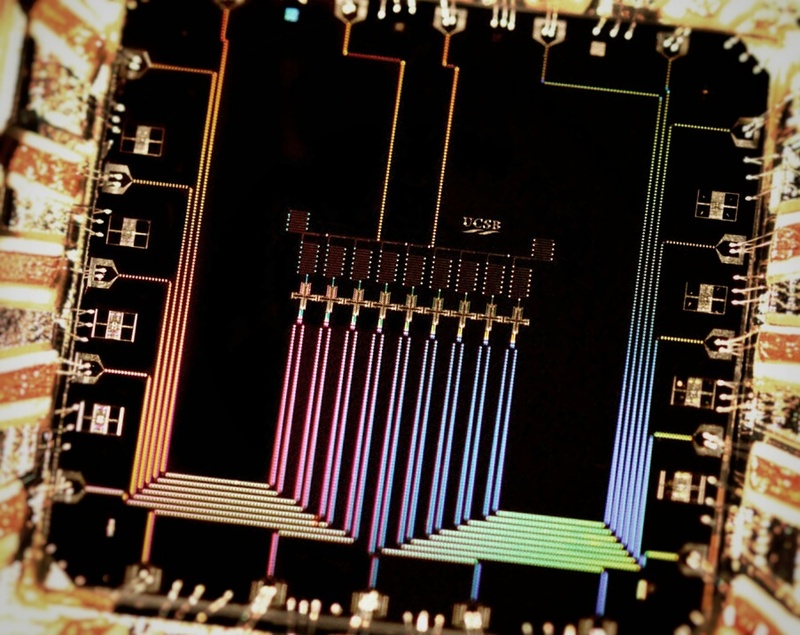 This photo by Erik Lucero illustrates our lab's ReZQu qubit architecture, the focus of a BBC article. AAAS Science "Breakthrough of the year"
Alumnus Dr. Aaron O'Connell was recognized by the AAAS journal Science for 2010's scientific Breakthrough of the year for his Nature article, "Quantum ground state and single-phonon control of a mechanical resonator". Pictured above is the actual device used in the experiment. 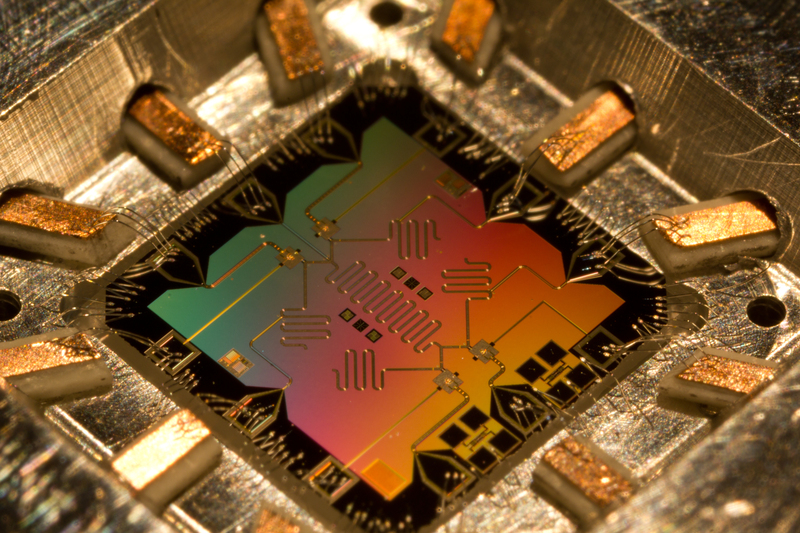 The mechanical resonator, which was placed in a superposition, is situated in the bottom left of the chip. The smaller white rectangle is the coupling capacitor between the mechanical resonator and the qubit. Photo by Erik Lucero. This photo by our own Erik Lucero is featured in the New York Times article highlighting our recent work on generating three-qubit entanglement (Neeley et al., Nature 467, 570-573 (2010). See publications.) along with work from the Schoelkopf group at Yale. 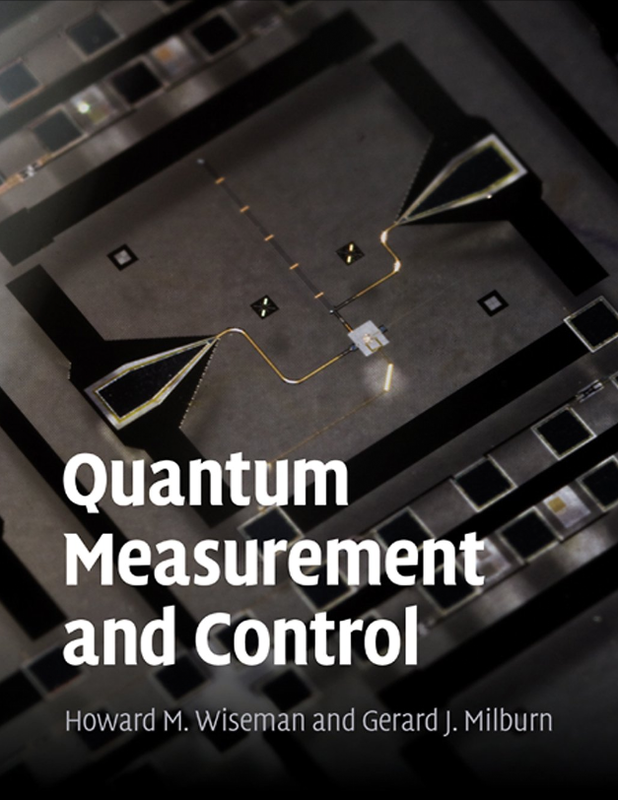 This photo by our own Erik Lucero graced the cover of the July 2009 issue of Physics Today, along with a feature article about superconducting qubits. The article discusses our work on arbitrary state generation in a harmonic oscillator (Hofheinz et al., Nature 459, 546-549 (2009). See publications.) 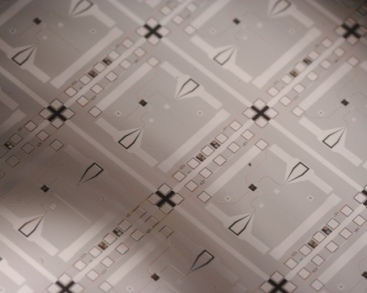 as well as work from the Schoelkopf group at Yale. 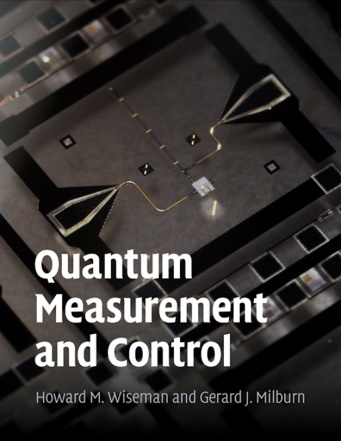 More recently, the photo was featured again on the cover of Quantum Measurement and Control by Wiseman and Milburn. Our research goal is to build a quantum computer using superconductors. Much of our effort is devoted to understanding the basic physics of decoherence (error) mechanisms in Josephson junction devices. 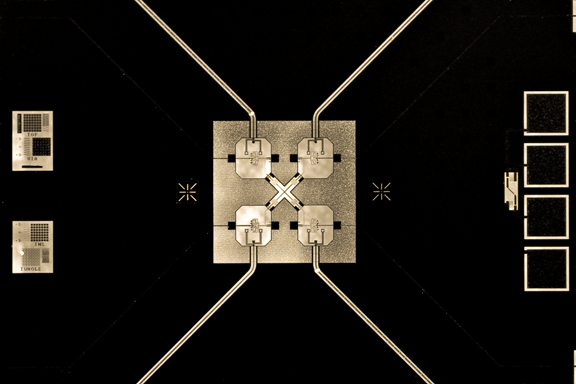 Pictured below is a wafer with test dies that we use to measure two-qubit logic gates. Our group is part of the California Nanosystems Institute.